Three years and one week ago, I was attending a talk about social media, and how we as business people could utilise it better. For me at the time, it was very relevant because I was working as a public relations consultant and the woman delivering the talk was of the same profession. One thing that she said really resonated with me, “I write a personal blog……………” and a thought jumped into my head. If I’m so interested in women’s cycling, why not start a blog about it. A week later – 13 August 2011, Women Who Cycle was born. At the time I was very committed to the idea but I hadn’t really thought past my first few blog posts and the basic structure of my site. I looked at other people’s blogs and saw that many of them had been going for years and wondered how they sustained it. I also looked at many blogs that had been started and abandoned down the track, some very fleetingly, and others that hung on for a few years and then petered out. I’m really happy to say that I’ve been able to sustain this blog for a full three years. I’ve posted every week for three years which is a total of 168 posts (I know that’s more than once a week for all your maths’ geniuses). I’ve even scheduled posts when I’ve been away on holidays like my recent three week trip to Peru. My very first post was about the low profile of women’s professional cycling, and I hope that in my own small way I’ve contributed to an improvement in coverage of women’s pro cycling, because there definitely has been one. Just have a look at the recent coverage of the women’s race La Course that occurred on the Champs Elysees prior the final stage of the Tour de France. A little aside here, if you want to read a great report about the race read Aussie cyclist Chloe Hosking’s excellent blog post. In the past year I’ve covered many topics including bird strikes, braking, nutrition, saddles, touring and interval training. I’ve also talked about bikes and equipment you need to get into road cycling. My most popular post has been road bikes for short women who obviously struggle to find the right bike even though there are plenty of small road bikes on the market. I get the greatest pleasure from meeting with great women in cycling and in the past year I’ve enjoyed interacting with Anna Meares, Tiffany Cromwell and Kristy Scrymgeour. I’ve also written posts about the inspiring Tina McCarthy who runs a business called Wheel Women and Emily Miazga who runs her own business called Em’s Power Cookies. So I plan to keep going with this blog for as long as I find topics to write about. Who knows how many years that will take? 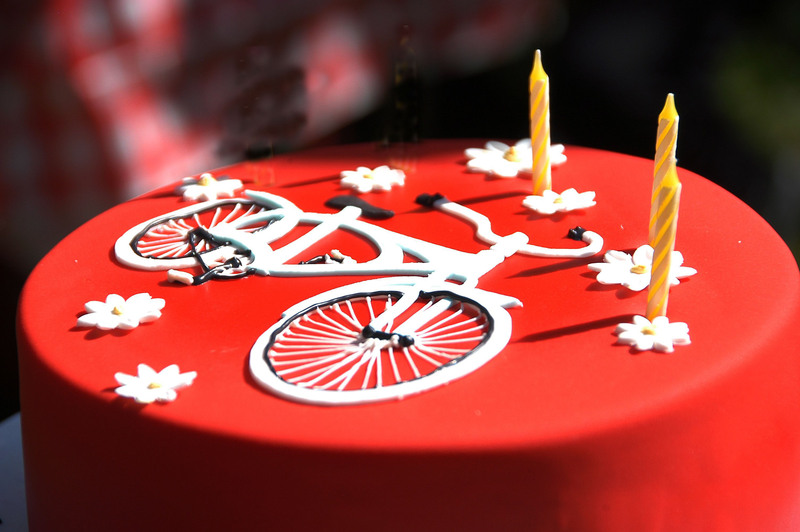 Happy, happy 3rd birthday Women Who Cycle, and congratulations on all you have achieved so far!